The Burnet Institute, the International Women’s Development Agency and WaterAid Australia have conducted a landmark study uncovering challenges experiences by women and girls in managing their menstruation. The research also examined whether these challenges make it difficult for women and girls to fully participate in school and work, and engage with their communities. Funded under the Australian aid program’s Pacific Women Shaping Pacific Development initiative, the ‘The Last Taboo’ is the first multi-country study of menstrual hygiene in the Pacific. Research and workshops took place in Fiji, Papua New Guinea and Solomon Islands in 2016 and 2017. The workshops brought together people working on gender, health, education and water, sanitation and hygiene to turn the research findings into program approaches. The voices of women and girls were central to the study. Women and girls shared the challenges they face in managing their menstruation, their preferences of sanitary products and their aspirations for how they wish to manage their menstrual hygiene. The study found that many adolescent girls in the Solomon Islands and PNG lack comprehensive knowledge about menstruation and are unprepared for their first period. This often results in feelings of shame and embarrassment for girls. Education and information frequently excludes women and girls with disabilities. “One of the difficulties the teachers face- they have the knowledge to teach in class, but they need training in how to teach it” (Teacher; rural Solomon Islands). In Solomon Islands and PNG, menstrual blood is typically viewed as “dirty” and menstruating women are considered “unclean”. Access to, and availability of sanitary products has huge impacts. Without sanitary products, women and girls’ common fear of leakage and staining, distracts them from school or work. Women employed in informal workplaces, such as market vendors, face greater challenges in managing their menstruation at work as they are often required to share facilities with the general public. 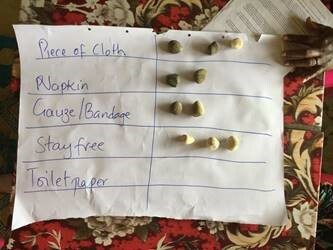 “After changing [sanitary pads], we have to take our dirty hands to the tap outside in order to wash them… It’s degrading treatment towards us women” (Women, urban, informal employment Fiji). This study provides clear evidence of the challenges women and girls in the Pacific face in managing their menstruation, while also providing practical recommendations so organisations and governments in the Pacific can act to address the challenges identified.